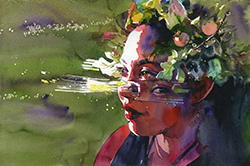 Joanna Barnum is an imaginative realist watercolor artist who was born in 1984 in Connecticut, raised in New York, and resides near Baltimore, Maryland. She earned a Bachelor of Fine Arts in illustration and art history from the Maryland Institute College of Art. 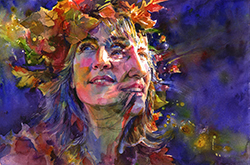 She is a Signature Artist of the National Watercolor Society, and her work has been exhibited with NASA Goddard, Abend Gallery, PoetsArtists, and Every Day Original; and recognized by Splash: The Best of Watercolor, Infected by Art, American Illustration, and Society of Illustrators West.